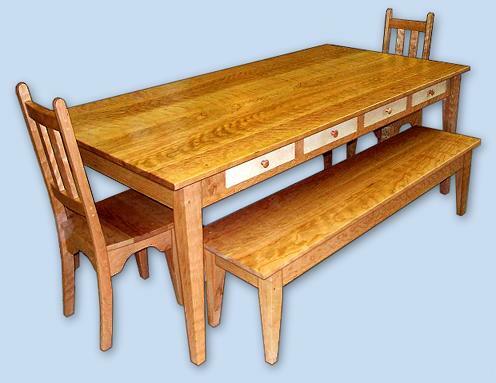 This solid cherry Shaker Dining Room Table is also known as a Harvest Table. It has straight tapered legs and 8 bird's eye maple dovetail drawers. The drawers make this piece and excellent kitchen work table. The benches are also made of solid cherry with straight tapered legs. The Shaker style solid cherry chairs have vertical slats. The front legs of the chair match the table and bench legs. An extension table which also functions as a side table is available to extend the table to 9 feet or 11 feet if two are used. A Matching buffet or server and china cabinet is also avaliable. 84" L. x 40" W. x 30" H.
72" L. x 15 1/2 W.